Adult content? Restrict it with Age Restriction popup! Online shopping is one of the best innovations of this century, isn’t it?! There are hundreds of eCommerce websites now available worldwide. You can buy anything you wish online, without leaving your house, office, or wherever you are. Most countries have restrictions on so called “adult products” selling to some age groups. And if you don’t know the laws well, you can be billed for selling some products to the age groups that you are not allowed to. And, if you have any such kind of an eCommerce website offering products meant for adult customers, you should be aware, that you need to restrict the access to your website from some age groups. The visitors must verify their age before accessing the content of your website. 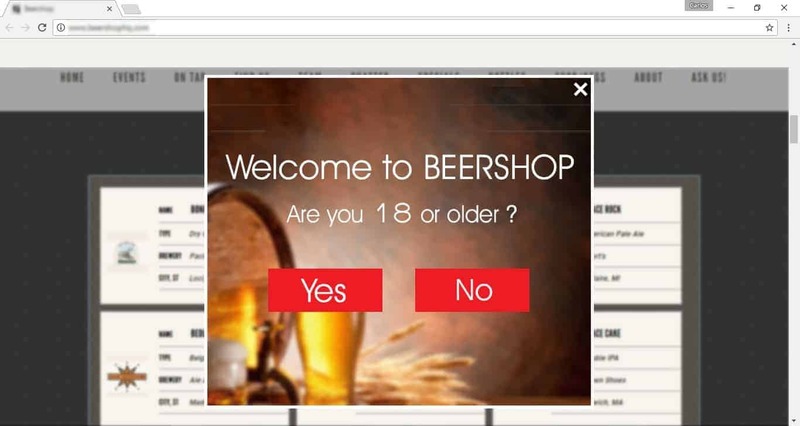 Let’s say you have an eCommerce website, selling alcohol. According to the law about alcohol selling in the UK, for example, to anyone under the age of 18 is illegal in England and Wales. You can even be billed to £5,000 for selling alcohol to visitors under 18. Here, you can see a table showing some Age restricted products and the Age restriction for them. *The list is for the UK. Source: Age restricted products in the UK. So, how to control the Age restriction online? That can be an easy task with a good popup generator, like Popup Maker! Simply create an Age Restriction popup and embed it into your website! The popup window will pop up when someone lands on your site. You can restrict their access to your content until they verify that they’re +18, for example. For this popup type, Popup Maker provides 2 buttons for selection, let’s say, “Yes” and “No”. Add a text in your Age Restriction popup, like: Are you 18+ ? So when the website popup appears on your site, the visitors will have to select “Yes” or “No”. They’ll have access to your content if they select “Yes”, so verifying their age. And, if they select “No”, they’ll be redirected to another page (that you want them to) where you can show a text explaining them the reason of the restriction of your content.